This attractive South African bulb grows and flowers during the Winter. This picture was taken on December 20, when this and several others were flowering for the first time since being grown from seed several years ago. 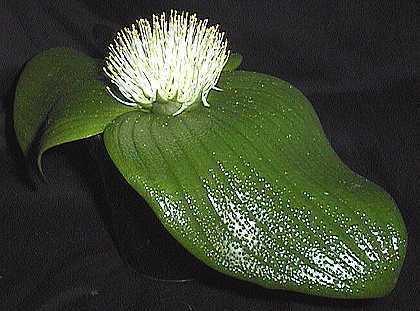 Each season, it grows just two attractively pustulate prostrate leaves, reaching more than 20cm from tip to tip, and the flower (actually many flowers) is really just a bunch of stamens.